The Office has a complicated history with one-hour episodes. Having navigated the choppy waters of the Jeff Zucker-masterminded “supersized” format—in which a show’s timeslot was expanded to 40 minutes in order to allow NBC to sell more ads around that episode—the show tried its hand at a pair of hour-long installments in its third season. One of those episodes, “The Job,” is a highlight of the early seasons and a major turning point for Jim and Pam’s relationship. The other, “A Benihana Christmas,” suffers in comparison to the previous year’s holiday episode, yet makes good use of its extra legroom while building a solid Michael Scott story out of and into its Christmas-party shenanigans. That success might’ve gone to the heads of the show’s producers and network, however. The following season opened with four hour-long installments—not all of which merited the additional time. Since the fall of 2007, extra space has instead been afforded to premières, finales, and big events like the Beasley-Halpert wedding or Michael Scott’s final Christmas with Dunder-Mifflin. 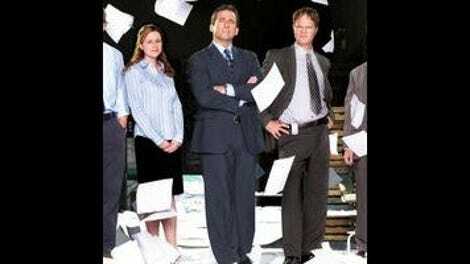 After biting off more than they could chew at the top of season four, the producers seemed to learn that the pacing and storytelling style of The Office operate better within a half-hour timeframe. All of that makes an hour-long curiosity like “Moving On” all the more curious. Unlike the last time NBC put up a full hour of The Office—just two weeks ago, with “Junior Salesman” and “Vandalism”—this is a single-episode affair, an opportunity to pay attention to more characters than would fit into the average episode of the show and/or really dig in to multiple plot threads. By doing this, “Moving On” falls into a tricky paradox: It’s both brimming with narrative yet straining to fill its allotted time. The episode suffers from a lack of storylines like the one that grants Toby closure for his role in convicting the Scranton Strangler: In a single beat, the character learns (the hard, offscreen way—because the cameras can only follow Toby so far) that, yes, he put the right man behind bars. So that’s settled, and now moving on, as the episode’s title says. It’s funny that the strangler should provide the episode’s quickest resolution, considering that Toby’s doubts about the killer’s true identity have hung around since he returned from jury deliberations nearly two years ago. Andy’s wounded heart pushes him to some dark, vengeance-seeking places in “Moving On,” but that plot to get back at Erin and Pete requires most of the hour to land. It’s an attempt to give the regional manager some comeuppance for his poor treatment last week, but this character is so far gone that no amount of last-minute humanizing can win the audience back to his side. To that end, it’s good that his motivations are on the side of evil—it’s just too bad the writers didn’t decide to push him further into full-on villainy. A friend of mine recently shared a “What if?” for the latter seasons of The Office that never occurred to me: What if after Jim and Pam’s wedding, those characters were pushed to the background and the show transferred the attention it had lavished on the Halperts to doing the same for Dwight and Angela’s romance? On weirdness alone, she reasoned, The Office would be a much more interesting show than what it’s become. While I agree with that point, I think a Dwight-Angela-centric Office would make for much more challenging viewing, if only because a little bit of Dwight goes a long way. “Moving On” tests this theory by isolating Dwight and Angela in Schrute Farms territory, providing a weird, sideways glance at that theoretical version of the show. Washing elderly aunts, firehoses, and ludicrous serving sizes of schnapps: These are not the makings of the average Office installment. They’re not the makings of a particularly good one, either, but this little excursion to the farm (if not The Farm) maintains “Moving On”’s momentum in its lumpiest sections. To push the characters and the show toward the next stage of their lives, tonight’s episode had to draw on the past—to the detriment of the episode, though that might also have to do with the stalling required by the hour-long timeslot. Bob Odenkirk is fun for a few minutes as a Philadelphia real-estate boss with plenty of Michael Scott-like tics and fixations, but the joke is driven into the ground before the inherent sourness of an Odenkirk performance starts to add an intriguing edge to the character. It’s easy enough to pick up on the character’s implied similarities to Michael—and now we have a good idea of how the old boss would’ve treated the “Gangnam Style” meme—but the joke is punctured by a talking head in which Pam confirms, in so many words, “Hey, this guy is just like Michael Scott.” An hour is a lot of time to fill, and “Moving On” goes about doing so by leaning hard on one of The Office’s most trusted standbys, using the confessional Q&As as time-killing crutch to make it across the finish line. I’d be interested to learn if “Moving On” was originally a standard-length episode of the show. Certain elements suggest it was expanded during the post-production process—the throwaway nature of Toby’s visit to prison, for instance, or the extent of Andy’s revenge versus the amount of time it takes him to remember Plop’s real name. Yet while Andy contrives (Pete’s word, but one I’d use, too) his romantic retaliation by introducing Pete and Erin’s exes into their work environments—or in the case of Gabe, re-introduce—“Moving On” continues this final’s season’s trend of finding the most satisfying material in the most dramatic of places. Dwight’s plea to Angela on the front porch contains a heartbreaking honesty that nearly cuts through the broadest facets of that storyline; Jenna Fischer and John Krasinski, meanwhile, share a devastating silence when Pam finally admits to Jim that a life in Philadelphia isn’t the life she wants. Like much of what comes out of “Moving On,” it’s taken a long time to get there—unlike most of the episode, however, it’s worth the wait. Pam’s not seeking closure necessarily, but from an emotional standpoint, her facing up to the truth leads her and Jim to the same conclusion as Toby’s visit with the Scranton Strangler: It throttles them. Then again, the sickest burn of the evening belongs to Pam Halpert. As she heads out to her job interview, Andy asks where she’s going—to which she replies “Uh, not on a three-month boat trip.” The disdain in Jenna Fischer’s read of the line is delicious.